There is nothing good about Black Friday. It is a physically and socially uncomfortable spectacle where we watch capitalism progress to the point that we beat each other with flatscreen TVs in a Walmart at 4am. Stay home. Stay with your family. Stay online, where you can peruse not only fine websites such as this one, but the many, many deals and discounts that come with Cyber Monday. We'll be keeping an eye out for the best Cyber Monday travel deals on airfare, hotels, tours, cruises, theme parks, and more. Even better, some of these deals extend past Cyber Monday -- a few of them into early December. Sure, it’s your best shot at kitchen appliances and discounted pet litter on Amazon, but Cyber Monday is also when travel companies and boutique hotels and major US airlines are breathlessly competing for your pajama-clad and sofa-bound business. It’s an exceptional time to poke around and make some of your most exciting travel plans for the coming year, both around the world and in your own backyard. Thank goodness none of it involves going outside or talking to people. The Azores Islands are basically the Hawaii of Europe, a tropical volcanic wonderland that you should visit ASAP before everyone and their mom does. Conveniently, Azores Getaways is offering a steep discount on its seven-day Boston to Terceira trip when you book between November 23 and November 27. The week-long trip including round-trip flights and luxury accommodations at a 4-star hotel comes to $499 all-in. Intrepid Travel -- the adventure travel company that hosts small group trips all over the world -- is offering 20% off more than 1,000 excursions. Whether your heart is set on a foodie trip or a cycling trip or a family-focused trip or one you can share with other millennials, you’ll find something here. Destinations on offer include India's Golden Triangle, Vietnam, Jordan, Israel & the Palestinian Territories, and Tanzania. Book here between November 20-28. 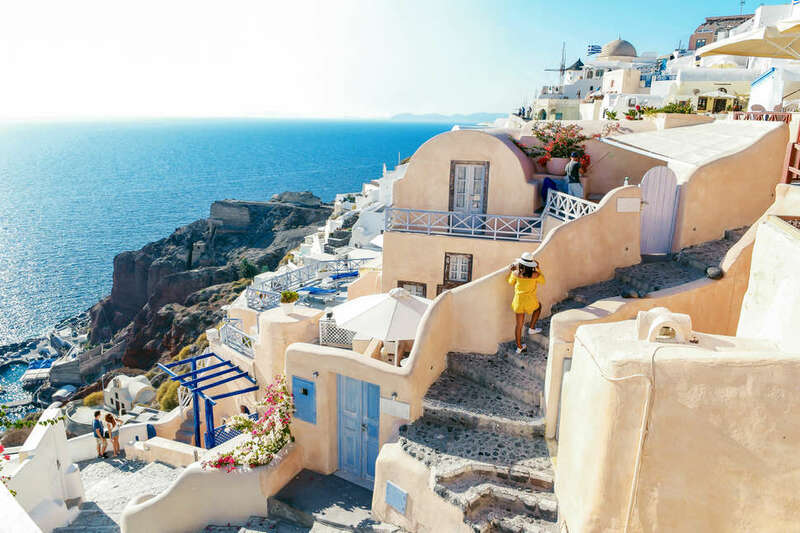 Similarly, millennial-focused tour company Contiki will be running deals from November 23-30 -- you can snag 20% off more than two dozen 2019 travel packages, like this nine-day trip through the Aegean Islands in Greece. You can snag up to $799 in savings with tour company Trafalgar, offering 20% off when you book through November 30. Get in on trips like the all-inclusive 17-day Highlights of Eastern Europe journey through Vienna, Zagreb, Budapest, Berlin, and Prague. Check out these other wildly fun, wildly underrated Eastern European cities while you’re there. If you book before November 30, Peregrine Adventures (also part of the Intrepid Group) will let you bring a friend on one of three adventure cruises through Thailand and Malaysia for free yes that’s right I said free. Trips depart December 2018 through February 2019. To book, call 1-800-663-5132 or chat with a sales rep here. Friendly Planet Travel is offering Cyber Monday savings to the tune of up to $1,900 per person, to more than 50 destinations. Beginning at 12am ET on Monday, November 26th, you can get maximum savings on trips like this eight-day journey through Cuba. Tour operator Aventuras Mayas is offering 50% off trips to Mexico’s Riviera Maya through November 2019. You can book online with the code BF2018, then get busy stocking up on sunscreen. CheapCaribbean is offering up to 70% off all-inclusive trips to what it predicts will be its top five travel destinations of 2019: Dominican Republic, Jamaica, Bahamas, Los Cabos, and Cancun/Riviera Maya. Prices start at $349 for three nights, including flights. The booking window will last through November 26. Wow Air is offering up to 40% off flights taken between now and April 10, 2019. The airline’s hub is Reykjavik, so it’s a great time to book that trip to Iceland you’ve seen all over Instagram -- but there are routes from the US to European cities including Paris, Amsterdam, and Barcelona too. The sale lasts until November 28 -- just use the code WOWCYBERMONDAY at checkout. Alaska Airlines is offering all kinds of discounted Cyber Monday tickets starting at $39 one-way. Not a typo. Over at South African Airways, you can snag round-trip flights to Johannesburg from New York or Washington DC for under $700. The Cyber Monday sale at Emirates, meanwhile, lasts until November 30. You can get round-trip tickets from New York to Athens for as low as $529. The Aer Lingus ‘Black Flyday’ sale actually lasts until November 28, and it’s where you can find $50 slashed off flights to Dublin from all over the East Coast. Travel dates for this one are January 8, 2019, through March 22, 2019. Scandinavian Airlines will take you to cities like Copenhagen, Oslo, and Stockholm for under $400 round-trip. The sale applies for travel dates between January 8, 2019, and May 17, 2019. Norwegian Air is offering discounts through the end of Cyber Monday -- get yourself some tickets to Copenhagen for under $150, or Guadeloupe for under $60. That’s right: the Caribbean, for $60. You’ll just have to travel before March 31, 2019. The Bahamas: You shouldn’t need an offer to want to go to the luxury Grand Isle Resort & Spa on idyllic Great Exuma, but you’ll get one all the same: 60% off villas, plus up to $250 of resort credit, for selected dates in 2019. Atlantis is offering one big deal each day between Thanksgiving and Cyber Monday -- look here for daily savings on hotels, airfare, and resort credit. Beachside Breezes Bahamas, meanwhile, is offering rooms starting at $119 per person with $10 room upgrades through December 31, 2019. Bermuda: The luxurious Hamilton Princess & Beach Club -- the “Pink Palace” -- is offering 50% off best available room rates for stays until March 31, 2019, so long as it includes a Friday or Saturday night. Nashville, Tennessee: The JW Marriott Nashville is celebrating its very first Cyber Monday with rooms up to 40% off. Rooms start at $199, and you get free Wifi, cocktails, valet, and spa services. Here are some cool things to do when you’re in town. Manchester, Vermont: The boutique hotel Kimpton Taconic is offering an especially short-lived Cyber Monday deal that lasts just 112 minutes and 6 seconds (don’t ask why). Between 11:26am and 1:17pm Eastern on Cyber Monday, you can book a deluxe guest room for an already-discounted rate of $201.80 and get a second night for free. St. Louis, Missouri: The newly opened Angad Arts Hotel -- the world’s first hotel where you can choose your room by “emotion of color” (like yellow for happiness or blue for tranquility) -- is offering 25% off the best available room rate for guests who book suite stays for two nights or more before March 2019. Newport, Rhode Island: Gurney’s Newport Resort & Marina is offering 50% off all suites booked on Cyber Monday for stays between December 1, 2018, and April 30, 2019. The Caribbean: If you’re heading to St. Kitts & Nevis, firstly -- lucky you. And secondly, lucky you -- Park Hyatt is offering your fourth night free and $300 resort credit for travel through December 19, 2019. In St. Lucia, Marigot Bay Resort and Marina is offering up to 50% off all rooms when you book between November 21-27 for travel dates from November 22 to December 19, 2018, or from January 6 to June 30, 2019. Also the Caribbean: Meanwhile, deals at Bequia Beach Hotel (St. Vincent and the Grenadines) include 25% off the best available room rates for bookings through September 4, 2019 when the room is booked before November 28, 2018. Free spa services, too. Even more Caribbean: Curtain Bluff in Antigua is offering 20% off bookings for five nights or more through August 17, 2019. This includes all meals, drinks, activities, like water skiing and stand-up paddleboarding, plus VIP airport pickup. Mexico: In Cancún, the five-star Nizuc Resort & Spa is offering 35% off rooms, plus free daily breakfast for two at Café de la Playa. Book by 11.59pm on November 26, for travel between January 6 and December 19, 2019. London, United Kingdom: Through November 26, The Curtain Hotel & Members Club is offering 20% off best available room rates for stays between December 20-25, 2018, and January 1-April 22, 2019. Princess Cruises is offering savings of up to $450 per person (two people max) on winter 2018/spring 2019 cruises to the Caribbean as well as the Mexican Riviera. And if you book a cruise to Alaska or Scandinavia for summer 2019 through spring 2020, you’ll receive free room upgrades, gratuities, and up to $800 onboard spending money. The sale runs through December 3. River cruise line U is offering 30% off all bookings for 2019 voyages made on Cyber Monday, plus $100 onboard credit per person. You can apply the discount to trips like Northern France at a Glance, an eight-day journey along the Seine, starting at $210 per day. Ooh-la-lah.